It’s the playoffs and if you’re an inquisitive mind like me (and if you’re also looking for a good tip), you have a tendency to ask people who they like this weekend. If you’re not interested in football, you’ve probably stopped reading by now, but if you are, you recognize this weekend as the most exciting of the NFL season. That’s because the winner of the two games this Sunday, a.k.a., the AFC and NFC Championship Games, determine which two teams will go to the Super Bowl. The four teams remaining have arguably been the best four teams all year: the Kansas City Chiefs, the Los Angeles Rams, the New Orleans Saints and the New England Patriots. However, when you ask people who they want to win the Super Bowl, you’ll generally get five different answers. How can that be, you ask, when only four teams are playing. The answer, my friends, is simple. When asked who they want to win the Super Bowl, people will choose any one of these four teams they like the most, however, if they have no affiliation whatsoever, the answer you’ll most likely receive is… “Anyone but the Patriots!” Clearly this sentiment is far more common outside the states comprising New England but if you live anywhere else within the continental 48, take a straw poll and I bet you’ll be surprised how often you hear this answer recited verbatim. Well, we all know it started when Drew Bledsoe was flattened by Jets linebacker Mo Lewis, thereby allowing backup Tom Brady to take his place and never look back. It has been a period of unprecedented dominance ever since. All Brady has done is enter himself into the ‘greatest quarterback ever’ conversation, all the while leading his team to seven Super Bowls, winning five of them. 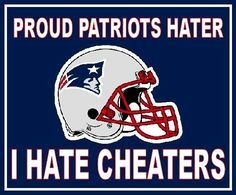 The answer “Anyone but the Patriots!” clearly marks a sore spot for some NFL fans but I couldn’t help but wonder why all this hatred came about. I mean, seven (and perhaps soon to be eight) Super Bowl appearances is certainly grounds for approval. So why would so many disinterested parties want so desperately for this team to fail? No, my friends, I’m not referring to the countless number of Major League Baseball players who took steroids in the nineties and are also commonly referred to as “cheaters.” I’m referring to the New England Patriots. 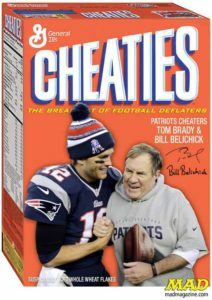 I guarantee you that if you ask someone why they don’t like the Patriots, they’ll inevitably bring up Deflate-Gate and Spy-Gate, two of the scandals for which New England has been associated just as much as their five Super Bowl rings. Spy-Gate, for which the organization and its head coach were both fined, involved them recording opponents’ practices… as if they needed to do that to get a leg up in the AFC East. And we all recall Deflate-Gate, wherein Tom Brady was accused of decompressing footballs to gain a competitive advantage. For this sin, he was suspended four games. These are the facts as we know them. It bears note, however, that just because no other team has been caught filming opponents or deflating footballs does not mean that it has never happened. I’ve lived in Boston. I remember a time when the only local teams that had won championships were the Celtics and to a much lesser extent, the Boston Bruins. Prior to 2004, the Red Sox hadn’t won a World Series since Babe Ruth was young and the Patriots, well, they had never won one. Boston was a struggling sports town with fans that suffered badly from championship envy. Fast forward a few years later and the area won five titles from the Pats, four more from the Red Sox and one more each from the Bruins and Celts. That’s an overflowing trophy case. Boston went from a town of loveable losers to a fan base that became quite unbearable. The only way sports fans outside Boston could make fun of those within was to joke that their heterosexual male fan base would gladly perform sexual favors on Tom Brady, far more so mind you than they would with his super model wife. To this day, you’d be hard-pressed to find a Pats fan that would argue this point. It’s hard to make an argument that Tom Brady isn’t the best (or at least one of the best) quarterbacks of all-time. Similarly, it’s hard to argue that Bill Belichick isn’t the best (or at least one of the best) coaches of all-time. What these two have accomplished is nothing short of legendary in the annals of sports history. Since Tom Brady took over (2001), the Pats have never had a losing record. His Patriots have won ten straight AFC East titles and have reached eight straight conference championships. For a league that does everything in its power to encourage parity, the Patriots thumb their nose at it. Even for the most ardent hater, those feats are rather impressive and likely never duplicated. I can come up with a few more reasons we as a collective hate the Patriots but they all boil down to Brady and Belichick: the two most despised, football men living outside of Massachusetts. Gregg Popovich and Tim Duncan won five titles together in San Antonio. People don’t hate them. Michael Jordan and Phil Jackson won six together in Chicago. Those two were revered in their heyday. Joe Torre and Derek Jeter won four World Series together and well, okay, that’s a bad example because everyone with a soul should hate the New York Yankees. But the New England Patriots have resoundingly become one of the most hated organizations in sports… for winning. Personally, I don’t have a problem with them. What they’ve done, regardless of how they’ve done it, is pretty damn impressive. That fact that people hate them almost makes me want to root for them more if only because their reasons for hating them are essentially unfounded and most certainly media-driven. They’ve put together an incisive brand of football, the best by far we’ve seen over the past fifteen years, if not ever over that extended period of time. If you hate them with a passion, that might just be a ‘you’ problem and it’s probably been a ‘you’ problem for a long, long time. The irony here is that, as a people, we don’t like change. Furthermore, we generally enjoy greatness and don’t mind dynasties… except in the case of the New England Patriots. In their case, we want nothing more than to see them fail miserably. Anyone, but the Patriots, because it happens so rarely. It is now mid-January. New England has potentially two more games to further cement their claim as one of the greatest dynasties in modern sports. It’s just too bad so many people are rooting against seeing it happen. This entry was posted in Featured, Pigskin and tagged Bill Belichick, Chicago Bulls, Drew Bledsoe, Gregg Popovich, Kansas City Chiefs, Los Angeles Rams, Michael Jordan, New England Patriots, New Orleans Saints, Phil Jackson, Super Bowl, Tim Duncan, Tom Brady by Chris Humpherys. Bookmark the permalink. Don’t get me wrong. I want to vomit every time I hear Bruschi talk about his former team. 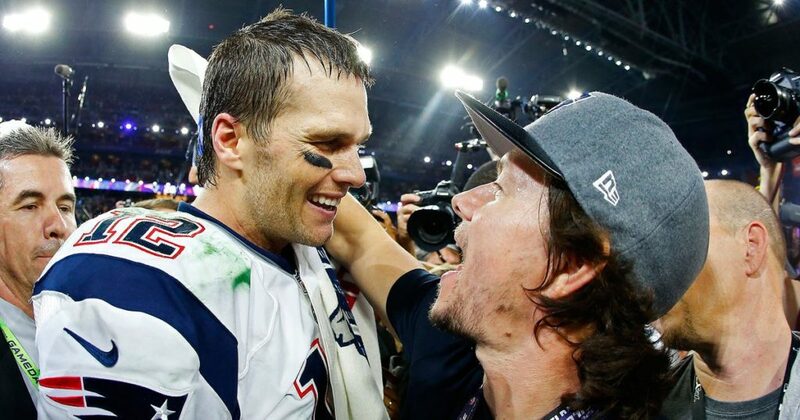 The guy has more of a man crush on Brady than Affleck, Damon and Marky Mark combined. But that just goes to show you what his time there meant to him. Brady has already been to 8 Super Bowls, lost 3 (Giants twice and Philly last year). This could be #9. 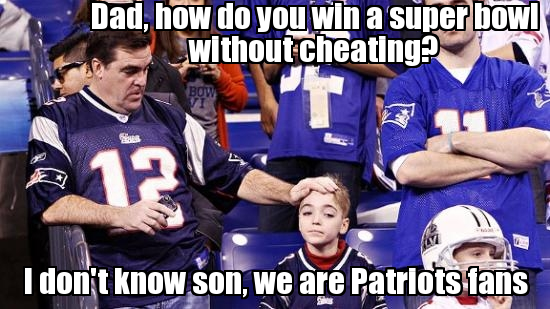 Go Pats – you’ve got to admire consistent greatness. To all the others I paraphrase an old saying…if you ain’t cheating, you ain’t trying. Tom Brady is the Sandy Koufax of football. Pardon the ancient comparison. Without him, they are at best a wild-card team. Belichick is a street smart coordinator and his own man. Stood up to Parcells and took off from there. I think the party is over with either Mahomes/Reid or for sure Brees/Payton. To clarify, I’m betting on the Pat’s demise and Robert Kraft’s eventual enrollment in the AA. How many times is this lie going to be spread. ESPN and a major news paper had to apologize for saying Patriots filmed practices. They were fined for filming their opponents sideline during the game from the wrong location. Hating on the Patriots, but overlooking the likes of the New Orleans Saints when bounties were being placed on the heads of the opposing players , in order to do them physical harm . Now that’s the type of idiocy, the sports’ fans must really yearn for . Not unlike their knowing , that the cheating that’s going on within the NFL, isn’t just done by one team alone. Let’s just put it this way, it’s like saying there was no collusion between Trump’s inner circle of followers and their meetings with members of the Russian KGB and GRU. Most everyone I know is on the Chiefs. I hope they know what they’re talking about. In retrospect, it still surprises me that the authories, if you will, went after them so hard in both cases. I mean, how long did it take from start to finish before Deflate-Gate was resolved, especially when you have other retired quarterbacks aka Mark Brunell, saying this is something that they did also. I haven’t placed a weekend wager yet but you know what I like. By the way, did you read about your ten for ten in the over/under contest? The Giants were huge underdogs in that Tyree game. I won some good money that night. But to remind us how impressive the Pats are, they’ve been amazingly relevant since that game while the Giants have definitely not. Either way, it was a hefty fine and loss of draft picks. Fortunately, the Pats know how to finagle their roster to see it through. I’m disappointed Josh Gordon see his own demons through. He would have been a difference maker. Kid’s amazing. Know doubt about that. I just wonder if he’ll be able to pull this one off. It’s gonna be a great damn game. No Chris, I just spotted it. I knew I hadda good year, but not perfect. Besides, if I don’t win, I don’t eat and the old lady walks. Thanks for the kudos. It’s how the fans are… they go into a cave if they don’t win. You hear nothing. But they are absolutely relentless and obnoxious when they do win… and that has gone on for 15 years and it gets old for people. People like parity. By the way, did I know that you lived in Boston at one point? I must be getting old. Thinking about a trip out for March Madness one of these years. Definitely won’t be this year but that’s a weekend I’ve never visited the desert. Consider it on my bucket list. Actually went to school at Tufts one year before transferring to Florida. It was ’86, the year of Red Sox-Mets. Oh how I have stories. As much as I hate Boston sports, I can’t help but admire what Belichick and Brady have accomplished. Both are the GOATS. Not going so far as to say I root for them, but I don’t root against them. That said, I will watch the Superbowl and hope the Rams lose. And here we thought the only worthwhile science to come out of Kentucky was bourbon distilling.